Amélie is a visually scrumptious film. Produced in 2001, it used the state of art digital technology to create a dream-like saturated image of Paris to represent the romantic, quirky and unique vision of the film’s protagonist – Amelie Poulain. While the film is not a food film as such, unlike Jean-Pierre Jeunet’s earlier work ‘Delicatessen’, food appears and/or is referenced in its numerous scenes. From the now-iconic images of little Amelie wearing fruit-jewellery, the cherry earnings and the delightful raspberry fingertips, to numerous comical incidents at the green grocer’s and the touching finale where Amelie imagines her love interest, Nino, getting the ingredients for ‘Miss Amelie’s famous plum cake’. Having watched this film an endless number of times, I can (geekishly) recall all of the food references and scenes pretty much in their chronological order. So when it came to creating an Amelie-inspired dinner party, I was not stuck for ideas, the menu simply wrote itself into my note book. The visual richness of the film also inspired the style of the table-setting: a rustic French theme with a few quirky injections of the filmic references and a touch of bright colours. Instead of using a tablecloth, I chose a warm-coloured table surface, red in my case, and laid the table with a beige linen runner and a matching set of napkins. A selection of jumbo candles together with some jars&bottles containing flowers acted as a centre piece. For this occasion I chose simple, wild flowers and herbs: rosemary proved a gorgeous ingredient both in the meal and in the floral arrangement. Chive flowers have the most gorgeous colour and also make a perfect link between the decor and the meal itself. As a place setting, I would create individual bouquets, containing lavender, rosemary and any other rustic greens that you find appealing. A simple luggage tag attached to the bouquet will help your guest find their way and make them feel quite special. To add a bit of quirk, reflecting Amelie’s character, I took inspiration from the paintings that feature so prominently in the film – Renoir’s ‘Luncheon of the Boating Party’ and the most adorable ‘Dog’ and ‘Goose’ paintings in Amelie’s bedroom who talk to each other once their owner falls asleep. I have printed several copies of these paintings (A5 size), framed them into small photo frames, and dotted them around the table at different angles, so that each guest has a good view of at least one of them. To make the dinner even more interactive and playful you can take inspiration from the photo booth theme of the film, using props like the hat and mask of Zoro, to add a little fancy dress element to the night and give an outlet to your guests’ creativity which will certainly be flowing after a few glasses of vino. Find your way to get under the chicken’s skin (almost Sinatra style) and gently push the mascarpone mixture, distributing it evenly throughout. Try to keep the skin as intact as possible to ensure the mixture stays inside during cooking. Sprinkle the chicken with some sea salt and crack some pepper on it too and send it off to the oven for 40 minutes or until the skin is golden brown and super crispy. Make sure no blood seeps out when you poke the chicken with a knife. Serve the chicken in the cooking tray (the ‘bedding’ will cook into the most beautiful abstract background) and make sure to pair it with the side dish of braised artichokes,fennel and new taters. Top the potatoes with layers of fennel, onion and artichoke hearts, add more salt, lemon juice, a bit of water, cover with lid and cook on medium heat for 40 minutes until all ingredients are cooked through. Keep adding water and butter in small amounts to prevent burning. Nothing can beat a delicious meal. Whatever your tastes, good food can hardly be surpassed by any other human pleasures. However, I always believe (almost compulsively), that the right setting in which this food is consumed is equally important. Even when I have the most delicious plate in front of me, I simply can’t enjoy it if the table is not set in the right way or there is something in the surroundings that just does not ‘work’ with the meal. In addition to that, I love a meal that tells a story. The words ‘curate’ and ‘experience’ have been recently overused and have become a trendy cliché of sorts. Yet, I really do think that an element of curation (a carefully thought-out and sustained theme or idea) always elevates the meal and gives it this little extra, which might not be strikingly visible to others, but makes a whole lot of difference to the dinner host (me). Having been indulging my obsession with finding and creating the ‘perfect’ setting for a dinner through the KinoVino gatherings, I wanted to take this pursuit further by starting a series of master classes on how to style a dinner party. It is always so rewarding and comforting to meet a kindred spirit who takes the colour and texture of the napkins, and the height of the candles as seriously as I do. I have found one in interior stylist, Hannah Bullivant, who co-hosted three KinoVino workshops with me. Her collection of props is my dream come true and any object that she pulls out from her old wooden crate (a piece of art in itself) that she uses to carry the props makes me want to jump up and down with joy (I do restrain myself though). 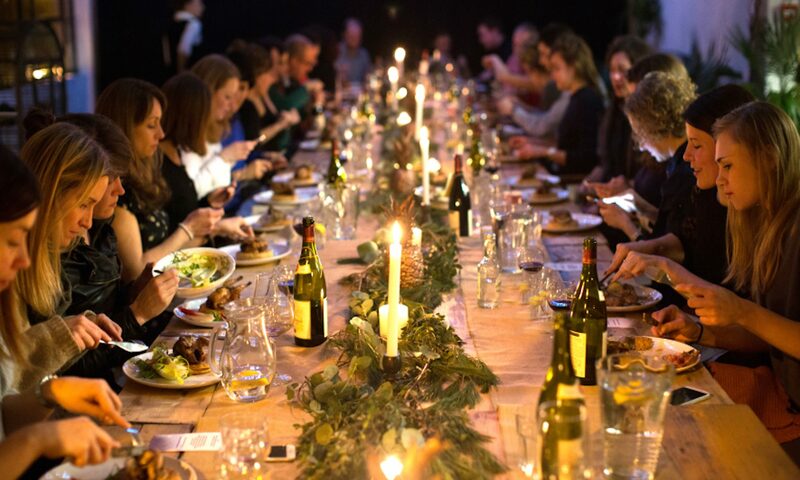 As well as having found Hannah, I was equally lucky with having found the space for these events, as creating the perfect dinner table in a room that does not have the right vibe would be simply useless. Green Lens Studios is a small venue/photographic studio, former stables just off Green Lanes, that has hosted some of the most memorable private and public events in my experience. Its owner, Yev Kazannik, has injected a lot of his own vibrant personality into the studio, making it a unique, cozy and characterful space, as versatile as your imagination allows it to be. Over the years, we held some film screenings, gigs, exhibitions, private dinners and discos, and now the new series of workshops. Giving off a vibe that’s evocative of a quirky loft and a rustic canal boat, the space has an amazing woodwork and is frequently flooded with most beautiful natural light; in addition, Yev’s amazing collection of vintage cameras and his own skills as a professional photographer, just make you want to take pictures as often as you blink, and not surprisingly most of them turn out pretty good. So it really was a no brainer when it came to the choice of venue for these workshops. The last of these was thematically connected to the most recent KinoVino gathering with Eleonora Galasso, dedicated to food and film from Rome. Having served an Italian feast and delighted our guests with the screening of Roman Holiday, starring the inimitable Audrey Hepburn, I wanted to carry this mood over into our master class. As well as taking inspiration from the ancient city, both Hannah and I wanted to reflect the change of season in the theme for this event. We have both spent some time browsing Pinterest but the best inspiration came from simply looking outside the window or taking a stroll in the park. The colour scheme was pretty clear – earthy, rich, natural browns, dark yellows, deep reds and a bit of golden touches. By a great coincidence this colour scheme was prevalent in Eleonora’s cookbook too. Hannah created some truly delicate arrangements with pressed leaves, some spray painted copper and golden others natural, as well as some twigs and branches. When it came to food, there I was trying to tie in all those themes and moods (Rome, autumn and Audrey) into one or two dishes. Challenging myself to a bit of an invention test with the ingredients that were left behind the main KinoVino dinner (no waste!) and taking a brief flip through my treasured book ‘Audrey at Home’, I decided that an Alpine rosti with a chard, spinach and feta topping would perfectly marry all these concepts – it’s seasonal, thematically and gastronomically tied to both Audrey and the KinoVino meal, plus the colours of the dish would work so well with the colours and textures of our dinner table. So when we gathered around the table there was a perfect sense of harmony, joy and playfulness (perhaps perceptible to just me but hopefully to all of us) in having created, dare I say, an experience of a meal, where each element was as important as another, and had a specific part to play. Would the meal itself have tasted any worse if instead of the rough grey linen napkin we had some disposable ones in different colours? I genuinely think it would have. So here’s to being slightly compulsive and approaching each meal with care and imagination, striving to create an ultimate harmony between the food, the setting and yourself. An Audrey-inspired seasonal meal: an Alpine rosti with a chard, spinach and feta topping. Grate the potatoes into a bowl and strain the liquid. Add the rest of the ingredients, apart from the olive oil, and mix well. Lightly grease a non-stick oven-friendly frying pan with some olive oil and place on the hob. Once heated tip the mixture into the pan and distribute it evenly forming one thick ‘crumpet’. Fry on medium heat until the bottom starts to crisp up (aprox 5 minutes) then place in a pre-heated oven at 180C for 30 minutes. While the rosti is in the oven prepare the topping. Cut the onion into feathers and fry until softens in some olive oil, salt and chili flakes. Cut the pepper into long strips and add to the pot together with the onions. As the peppers begin to soften add thinly sliced garlic, and roughly chopped chard and spinach, add more salt to taste, lower the heat and let it cook for 5-10 minutes. Once the spinach and chard have wilted take off the heat, add the lemon juice and stir thought. When the rosti is ready (it should be crispy and golden, with a slight charring effect in places) flip it out of the pan onto a wooden board and top with the spinach/chard mixture and crumble a generous amount of feta on top. Add a last sprinkle of pepper before serving. We played some David Gray to accompany the meal. Not particularly Italian or Audrey-esque, but felt rightly autumnal and appropriately nostalgic. I enjoy a gathering with close friends around a table full of delicious food at any time of the year and time of the day. Yet, there is something extra-special about a table illuminated by the Spring sun on a Bank holiday Sunday. What is even better is a lunch that gradually turns into a dinner, while the wine still flows and the food resources seem endless. That’s the kind of lunch/dinner I had with my dearest friends recently, to celebrate Easter and the first rays of the warm(ish) sun. To accentuate the lightness of the day, I chose white linens and white tableware, with a little accent of colour coming from the flowers. The food was also all about the lovely contrast of pale and bright colours, as well as creamy textures and sharp flavours. Our entree was a plate of beetroot pickled eggs stuffed with herbs. Followed by a creamy cauliflower soup with herby dressing. For main we enjoyed a creamy mushroom pie served with roasted new potatoes and a crunchy salad of broccoli, sugar peas and asparagus. The desert will be left out of the picture until I find the tune the recipe well enough for sharing. The meal was enhanced with some wonderful drinks: a white wine Sangria, and some beautiful South African wines – a red Cab Sav from Vergelegen and an amazing ‘special edition’ white from Steenberg. Add to that the wonderful company of the people I love, and I think this day would be by Groundhog Day of choice. 1. Roughly chop the shallots and garlic and fry them on a medium heat in a pot until softened in butter and oil with a pinch of salt. 2. Roughly divide the cauliflower into florets, chop them into equal size chunks and add to the pot. 3. Keep adding a bit of water to prevent sticking and burning. 5. Add the cream and using a hand blender blitz the soup until it reaches a smooth creamy consistency. Add cream/water and seasoning if required. One of the things that I love most about cooking is the spontaneity of ideas and inspirations, how one thing can lead to something entirely new and surprising. The pickled beet makes a perfect starter course when combined with a yoghurt-dill-sumac dip. All it takes is a mix of 5 table spoons of Greek yoghurt with 3-4 pinches of sumac, a finely chopped handful of fresh dill and an addition of garlic-infused olive oil with a teeny pinch of salt. Yum! The rich and sharp flavour of sweet-cinnamonie-slightly-bitter-bayleaf beets works magically well with the creamy refreshing and slightly tangy presence of the dip. The pickled cauliflower called for more cauliflower on the table. So I made some whole-roasted ‘steaks’. Again the method could not be more simple. Take a small cauliflower, discard the leaves and cut of the bottom stalk (although there is this great no-waste tendency to roast the entire veg as it is, I am yet to master that skill). Place the cauliflower on a sheet of tin foil, in a cup mix some olive oil, sea salt, toasted and ground coriander and cumin seeds, and smother the veg in that mix. Wrap it in tin foil and bake on 200C for about 40 minutes. The two types of the same veg work really well as a duet and can be brought together even closer with a sweet potato-tahini dip, as an option. An all time favourite alternative to and cross between humous and mash, this dish is a regular on my table. Use two large sweet potatoes. Cut in 4 wedges, smother in olive oil and season with sea salt and a bit of cinnamon. Bake on 250C or as high as your oven can go, until perfectly soft and slightly candied. Once it has cooled down, remove the skin and place in a food processor with 1/4 to 1/2 jar of tahini and a very generous glug of olive oil+an equally generous pinch of salt. Blend until it reaches a silky smooth consistency. This paste is amazing on its own with any kind of bread but also as a base for the cauliflower ‘steak’. I was pleasantly surprised how my unplanned pickling compulsion turned into a beautiful, delicious feast which I have enjoyed with my friends and quite a few glasses of red. And the best thing about this experience is that the jars of pickles are still half full and will last a while (if I let them) and there’s a bit of sweet potato-tahini dip waiting for me in the fridge, so without further ado I will have to indulge myself in a little late-evening snack. Falling into the Orientalist trap, I have to admit that I do find something very sensual, indulgent and seductive in the idea of the Middle East. As clichéd as it might sound, the vibrant colours of the spices and the incredibly rich flavours they produce, constitute the most alluring of all cuisines to me. So I decided to take the classic Russian meal – borsch and pirozhki (not to be confused with the Polish pirogi) as a departing point, and turn it into a Middle Eastern-infused delight. As a result I got a meal perfectly suitable for a Valentine’s dinner or for any other time of the year, when you want to treat yourself: a harissa-spiced beetroot soup served with feta, dill and walnut boreks. Put all of the ingredients in the food processor and blend until a paste is formed; it is up to you to decide how crunchy or smooth you’d like it to be. Lay out a sheet of filo and brush it with olive oil. Fold in half lengthways and place a full teaspoon of the mixture on the bottom left corner. Fold left corner down to make a triangle, then make a next triangle by folding it from bottom left up and so on until all of the pastry is rolled and you end up with one triangular shaped parcel. (Watch a YouTube video if what I’ve just said makes no sense at all). Brush with more oil and sprinkle with sesame seeds, before placing in a preheated oven. Bake for about 10 minutes at 200C. Serve together with the beetroot soup while still warm. Ideal for dunking into the soup but can be enjoyed as a starter too with some red vino! The best way to battle a major case of post-festivities blues (which I am currently experiencing big time!) is to relive the joyful memories by finally writing up the recipes from some of the special December meals. 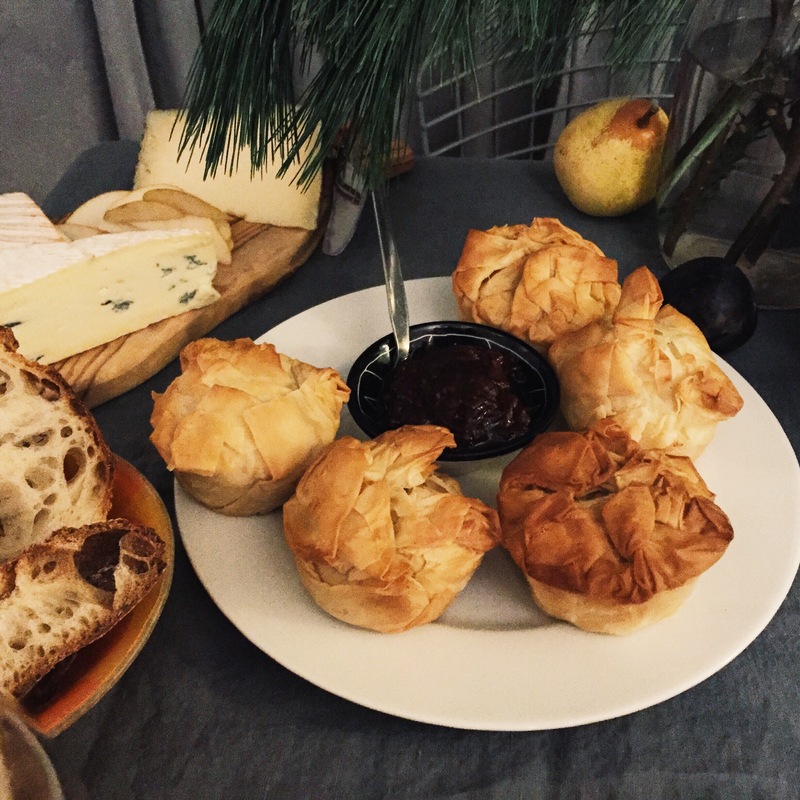 Both Christmas and New Year’s Eve were spent in the small and relatively quiet group of my nearest and dearest, allowing me some time for planning and executing the menu. 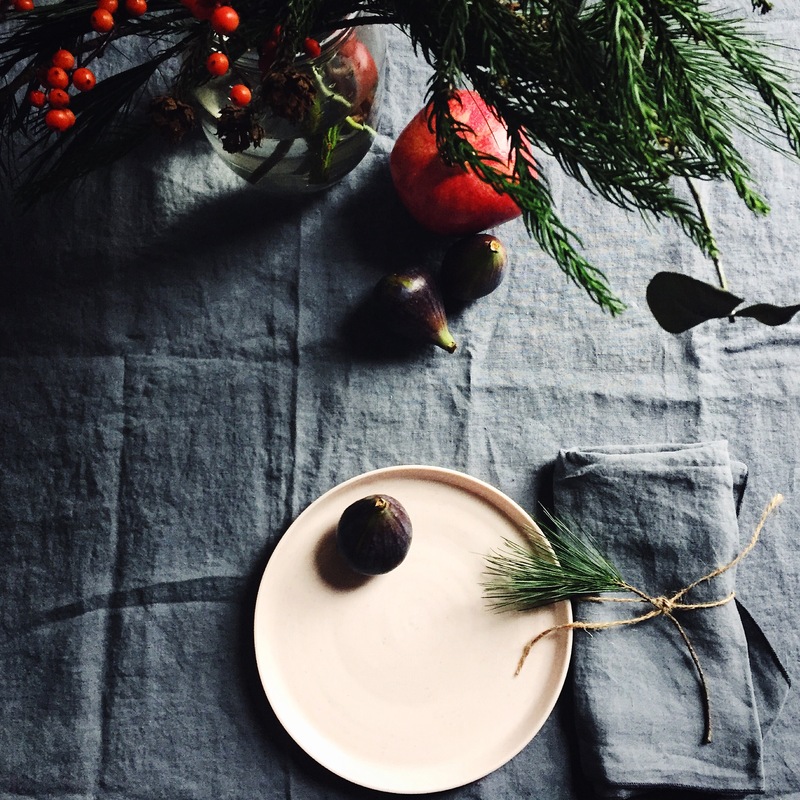 The best part of the festive season, as well as of any dinner party, is of course that magical moment when you conjure up images of the beautiful tablescape and let your imagination run wild inventing the menu. As the group of eaters was particularly small this year, I decided to bypass all the big classics going instead for a tapas style meal. 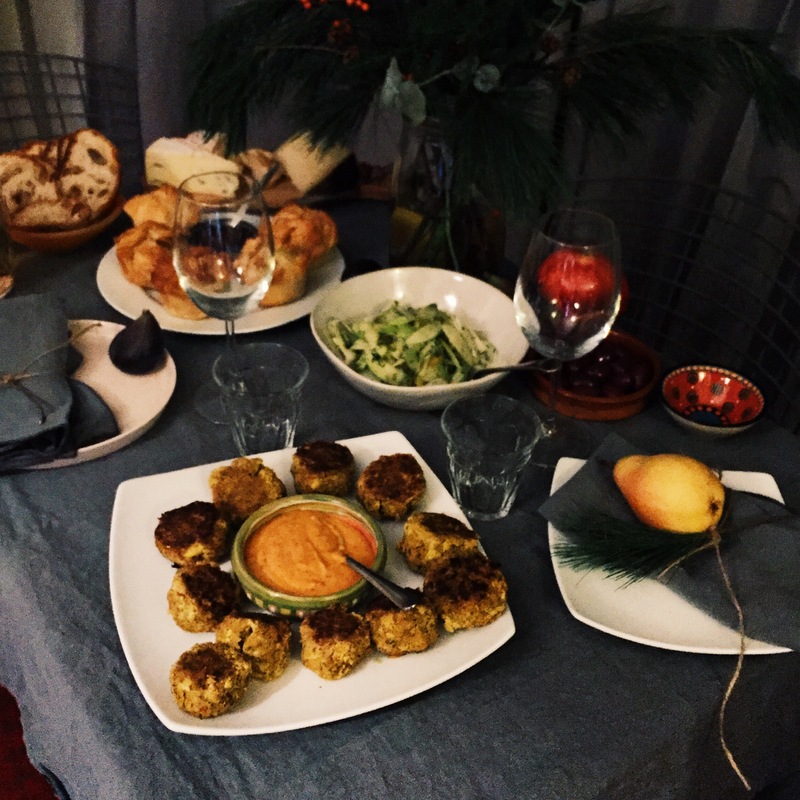 It was a bit of an eclectic mix of Middle Eastern and Georgian recipes plus a few things inspired by some of my culinary (Instagram) comrades. The highlights of the night were: Persian lamb keftas, fish falafels, mini khachapuri muffins and a spicy fennel-orange pickle salad. So here’s how I made these. Chop all the ingredients that need chopping then add them to the mince, eggs and the spices in a large bowl. Make sure to mix all the ingredients really well (for a good few minutes) so that the meat really absorbs all the vibrancy of the spices. Form the mixture into small even-sized balls and place in an hot, oiled pan. Fry the meatballs until really crispy on both sides and they begin to ooze an irresistibly delicious smell. These are equally delicious hot, lukewarm or cold. A good accompaniment to these would be a yogurt and fresh mint dip with a bit of lemon zest to balance the fiery spices. A food processor is a really handy companion here (though I have previously made a successful batch of these my finely chopping everything). Whichever way you decide to go, what you need to end up with is a evenly combined mixture which still retains some individual tiny bits of chickpea and fish; blending it into a smooth paste doesn’t really work at the end. Form the ‘dough’ into evenly-sized small balls … now there are a few ways these can be cooked. The best one is of course deep frying, but if you want to opt for a lighter (and less smelly) version then cooking them in a lightly oiled pan or in an oven works just fine too. To accompany these little gems you can make a dipping sauce of harissa and yoghurt or if you are going all the way, then use mayo instead of yoghurt. I am really in love with this recipe and these Middle Eastern beauties have become quite the regulars on my table. One of the most indulgent, heavenly-creamy creations of Georgian cuisine, khachapuri are flatbreads stuffed with salty cheese, egg and butter. Here’s a refined, lighter version adapted to the cheeses available in the UK. I have also cheated by using filo instead of making a proper rich and fluffy traditional pastry. Technically this is not really a khachapuri, but as this recipe was given to me by my London-based Georgian friend, it still bares a stamp of authenticity. Mix grated halloumi, crumbles feta and ricotta in a bowl together with the egg, some melted butter and black pepper. Use 1 sheet of filo pastry folded in half: butter it generously on both sides and carefully place inside a muffin mould (which also needs buttering, of course). Load the muffin to the rim with the cheese mixture and cover it with the ends of the pasty that are flowing out of the mould. Bake in a fan oven at 200C for about 30 minutes or until the pastry gets golden and crunchy. I have discovered that these muffins go exceptionally well with a chutney, becoming a centre piece of, as opposed to an accompaniment to, a meal. My current chutney of choice is Newton and Pott’s tamarillo chutney. This is officially my new favourite winter salad after sampling it at a dinner party of a dear friend (who happens to be a brilliant chef too). Mix the liquid elements in a large bowl. Add the finely chopped onion, grated garlic and leave to infuse. Meanwhile, finely slide the fennel and apple. Add it to the pickling liquid. Zest half of an orange, then add the flesh+some juice to the rest of the ingredients. Add the dill and jalapeños and season with salt. Leave to sit for about 10 minutes and boom! This will add a kick to any meal. Goes particularly well with the fish falafel and the meatballs (so this pescatarian was told). An even better way of dealing with post-festivities blues would actually be to recreate this meal immediately!